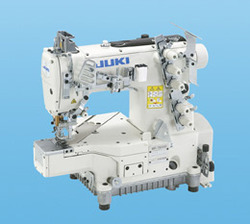 Footed in the year 2007, Balaji Sewing Machine Pvt. Ltd. is one of the pioneer business firms thoroughly occupied in wholesaling, manufacturing, importing and retailing a wide variety of products such as Lockstitch Sewing Machine, Chainstitch Sewing Machine, Cutting Sewing Machine, Leather Sewing Machine , Overlock Sewing Machine, Button Attaching Sewing Machine, Cloth Drill Sewing Machine, etc. Formulated beneath the command of assiduous employees, these offered goods are broadly recommended and acknowledged owing to their accurate designs, reliability and longer working life. Additionally, these products are tested thoroughly prior getting shipped at the destination of our patrons to ship a defect free array to our patrons.